Whatever your fitness goals, the gym at Barking Sporthouse and Gym has all the facilities needed to help you achieve them. Our fully equipped, 200 station gym is split over 3 levels, offering a range of fitness equipment for everyone. From cardiovascular machines, such as treadmills and rowers, to resistance equipment, free weights, 8 Olympic lifting platforms, dedicated stretching areas and fitness aids such as Swiss balls, TRX and VIPR's. Weekly fitness class programmes take place in the Barking Sporthouse and Gym studio and Group Cycle Zone. Activities vary throughout the week to provide you with a range of exercises to target the entire body. 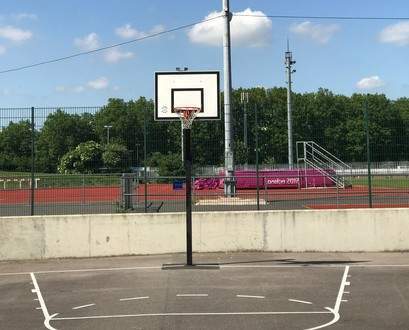 The Barking Sporthouse and Gym Sports Hall can cater for a number of activities such as badminton, handball, futsal and netball. Barking Extreme Trampoline Park includes a foam pit, dodgeball, free jump area, performance beds, slack line, fidget ladder and basketball. Visit the Better Extreme website for all the information and details of how to book. Barking Extreme Climb is a new climb facility which provides a number of fun adventure climbing walls designed to be multi-generational, appealing to both children and adult climbers. Barking Extreme Skatepark offers a new and exciting way for all age groups to participate in sport. The skate park offers over 900 square metres of skate ramp terrain, with a beginners area, street zone with ledges, ‘flat bars’ and ‘Euro-gaps’, and London’s first key-hole Birchwood bowl. The Barking Sporthouse and Gym outdoor basketball courts are available for sports specific use. Please note that they are not floodlit. For facility hire and event bookings please speak to a member of staff at reception to find out more. Whether it’s a place to meet friends for a catch up, or grabbing something pre or post workout, our cafe has everything you need. From delicious coffees, to deep-filled paninis, healthy snacks to wholesome meals, we've got something for everyone. At Better Coffee Corner, we pride ourselves on trading with strong ethical commitments, from serving Rainforest Alliance Certified coffee, to FairTrade Tea and selling water that donates to Water Aid. We even donate 2p from every hot drink we sell to our very own GLL Sports Foundation, to help talented young athletes achieve sporting success.